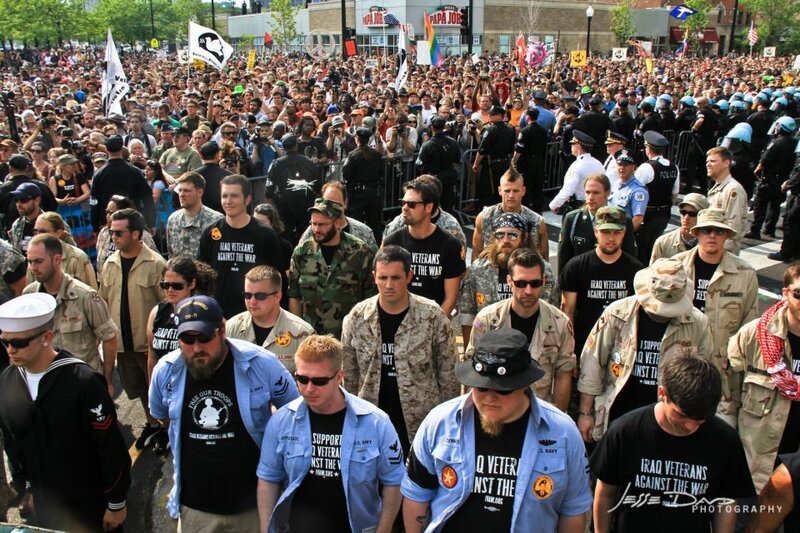 Afghanistan and Iraq Veterans, hand-in-hand with Afghans for Peace, made history this Sunday when they led a march of thousands against NATO, then returned their Global War on Terror medals to NATO's generals. With women from Afghans for Peace in the lead, almost 50 Afghanistan and Iraq veterans marched in formation, donning military uniforms and chanting and singing cadences: "No NATO, no war! We don't work for your no more!" Just blocks from the location where the NATO summit was taking place behind closed doors, veterans mounted the stage, announcing one by one why we were returning our war medals then throwing them towards the NATO summit as thousands cheered them on. "My name is Maggie Martin. I was a sergeant in the Army. I did two tours in Iraq. No amount of medals, ribbons or flags can cover the amount of human suffering caused by these wars. We don't want this garbage. We want our human rights. We want our right to heal." "My name is Brock McIntosh. I was in the Army National Guard and served in Afghanistan from November '08 to August '09. Two months ago, I visited the monument at Ground Zero for my first time with two Afghans. A tragic monument. I'm going to toss this medal today for the 33,000 civilians who have died in Afghanistan that won't have a monument built for them. And this is for the Afghan Youth Peace Volunteers. A total of 46 military veterans who have served since September 11th, 2001, chucked their medals towards the NATO summit. Chuck Winant returned the medals of six US war resisters living in Canada, who were unable to make it because they live in exile for refusing military service. Women from Afghans for Peace stood on stage with an Afghan flag alongside the veterans as they discarded their medals. The ceremony closed with the recitation of a poem by Saba Maher, a member of Afghans for Peace. Maher asked the crowd to bow their heads for a moment of silence for those who have lived under occupation. Many hung their heads and cried as the crowd fell silent. "I am not afraid anymore," later wrote Shawna Foster, military veteran and war resister who discarded her medals. "I do not believe there is a global war on terror. I will not be made a coward by my government to hurt other people because I have been hurt. Instead, I will stand up as a United States citizen and disobey unlawful orders to perpetuate war."